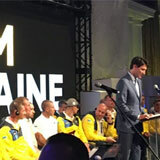 Victor Hetmanczuk, Canada Ukraine Foundation for New Pathway – Ukrainian News. 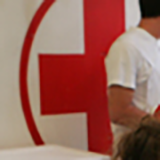 Canada Ukraine Foundation has been assisting Ukraine in various medical needs since 2014. The poor conditions of Ukrainian rural medicine have been in the spotlight for quite some time. When President Poroshenko announced in August, 2017, that Ukraine was going to invest into improvements of its rural health system UAH 4 billion (CAD 200M), it was time to start assisting Ukraine in this process. One of the ways to do that was to share the experience of Canada’s rural medicine with Ukrainians. In September, 2017, CUF’s President Victor Hetmanczuk sent an email to the Acting Minister of Health Dr. Ulana Suprun to propose a project that would bring three rural doctors to the University of Calgary’s annual Emergency Medicine Conference for Rural Hospitals in January 2018. The Ministry of Health sanctioned the trip in October, 2017. Candidates would be selected through an open contest. They had to work in villages, speak English and write a 300-word motivational letter why they wanted to attend the conference. Out of 50 clean applications, in December, 2017, Victor Hetmanczuk from CUF and Deputy Minister of Health Oleksandr Linchevskiy picked three successful candidates. CUF became the sole sponsor and organizer of the project, starting from Canadian visas, travel arrangements to facilitation during the visit. The total budget of the project amounted to CAD $ 14,400. The Ukrainian doctors participated in the conference on January 19 to 21, 2018, in Banff, Alberta and were able to observe local hospitals and emergency services. As the conference’s sessions progressed, Ukrainian doctors showed genuine interest and asked questions of the main speakers and other participants. The doctors also visited a hospital in Canmore, population 14,000, and a Community Mental Health clinic located in a shopping centre in Calgary. At the University of Calgary campus, they watched a live demonstration of the Rural Videoconference Program. This is a series of weekly, one-hour educational sessions via video conference presented by clinical experts. There were over 60 sites connected for this session. Presenter was in Thunder Bay, Ontario. Each presentation was focused on evidence-based information that is directly applicable to rural primary care and hospital environments. A one-hour meeting was held with the Director of the Continuing Medical Education program who explained to the Ukrainian doctors how the system works in Alberta. The Banff Rural Hospital was next door to the conference venue, so participants had the workshops in a real emergency room. 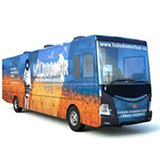 They also studied the STARS air ambulance system and visited the STARS mobile training bus, parked in the hospital parking lot. It needs to be noted that Canadian rural hospitals are not equivalent to the Ukrainian ones – there is a big gap in infrastructure and services performed. Some topics at the conference were not applicable for the Ukrainian participants due to current state of affairs in the Ukrainian rural health system. But this gave the doctors valuable information on how the Ukrainian system needs to develop. One of the participants, Ihor Zastavnyy, a general practitioner from Krakovets, Lviv oblast, noted that a plan needs to be formed for development of Emergency Rooms in Lviv oblast. He was ready to participate in trainings for rural doctors in emergency medical care. He also planned to implement changes at the Krakovets ambulatory based on the medical knowledge he gained at the conference. A family doctor Vadym Vus from Karpуlivka, Rivne oblast, noted that at the conference he gained information that would allow him to raise the quality and lower the cost of services he provides. In Canada, he obtained numerous contacts for such future endeavors as medical staff exchanges, acquisition of medical devices and cooperation with professional organizations. The Ukrainian doctors also had a chance to learn about the Ukrainian Canadian community and its history. They visited the Internment Museum in Banff and St. Vladimir’s Ukrainian Orthodox Church and Cultural Centre in Calgary. On one of the evenings, they had a meet and greet session with the Ukrainian Canadian Professional and Business Association of Calgary at The Assumption of the Blessed Virgin Mary Ukrainian Catholic Church. They also were hosted in a private home of a Ukrainian Canadian family for supper. The long-term impact of the visit on professional careers of the Ukrainian participants and changes to the rural health in their villages is going to be monitored by CUF for at least three years. The participants have already started up an NGO group, Academy of Family Medicine of Ukraine. They are training other doctors about the ICPC-2 (International Classification of Primary Care) program. As events unfold, we will report the results. 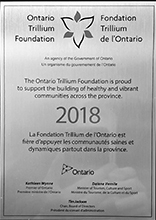 In June 2018, the Ukrainian Canadian Congress (UCC) and Canada Ukraine Foundation (CUF) announced the successful grant recipients from the Defenders of Ukraine Fund. One key factor in evaluating the projects has been the use of evidence-based methodology by its organizers. This project followed the training created by Ditte Marcher, Director of Bodynamics International, and is based on the 30 years of experience working in the war zones. The training was first carried out in Denmark for the Danish veterans in 2013-2014. The first training in Ukraine was taught by Ditte Marcher and the Ukrainian assistants in 2015 based on the contract and the request of the Healing War Scars organization. Four groups of veterans graduated the training based on this methodology in 2016, two of these by the “Pobratymy” organization and two groups (1.0 and 2.0) by Healing War Scars. The training consists of the 4 levels. At each level, the veterans are expected to increase awareness of their own psychological states, start to create the safe places and find safe people; the veterans are provided with the opportunity to find and realize resources for rehabilitation in one’s own body; the participants investigate their own shock history and assimilate the peak experience; the veterans are provided with the opportunity for reorientation and post traumatic growth. In order to estimate effectiveness at the different training stages, the following physiological evaluation methods have been used: PTSD probability evaluation and symptoms manifestation, Mississippi scale for traumatic reactions evaluations, Dissociation disorder, Depression disorders, Post traumatic growth evaluation and employment Risk and Resiliency Inventory-2. 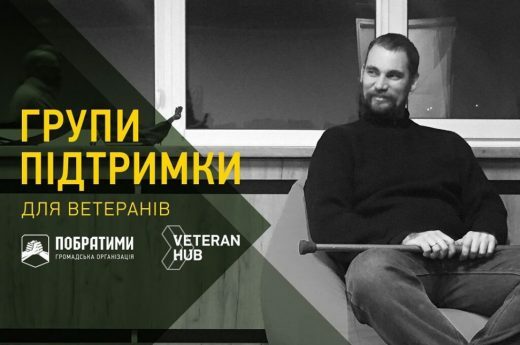 Under the Defenders of Ukraine Project, from 24th of July till 20th of December 2018, Public Organization Ukrainian Public Union “Pobratymy” has conducted 44 Peer Support Groups for veterans and their spouses on a regular basis at the Veteran Hub in Kyiv. Throughout the project, there were 157 veterans and 182 wives involved. The support groups were held as open meetings based on the “Peer-to-peer” principal. Peer Support Group is a special format of group work, where members of the group can share their experiences and difficulties not only about warfare and waiting for their spouses from war, but also the experience of the consequences of the traumatic events. There are some rules established such as confidentiality, the prohibition of alcohol and drugs, the criticism of the participants of the peer support group, giving advice and political discussions. The groups were led by professional psychologist and veteran Andriy Kozinchuk while the graduates of past psychotherapeutic training organized by Pobratymy and volunteers from veterans or their wives assisted. Groups have been given the opportunity to free up from the behavior of aggression, receive support from individuals with related experience and verbalize those topics that are not widely spoken in society. Fear, the lack of identification in civil activities, anxiety, feeling of guilt, lack of emotions or aggressive behavior towards loved ones are the main topics that rise at peer support groups. The participants have been given the opportunity not only to think about these kinds of unpopular topics, but to talk about them. A peer support group is a place where you can say everything you cannot say anywhere else and feel secure. As a result of peer support groups, three veterans discovered new kinds of activities for themselves and five veterans strengthened themselves in their actual activities. According to their words, relations in their families have improved and the level of communication with children has increased. We can’t affirm that this was all because of peer support groups, but the indirect influence of it was confirmed by the participants themselves. Oleksiy, 26 years old. He was seriously injured, due to that he is limited in heavy physical activity. He had problems communicating with his family. To solve this problem, he had to go to a psychiatric hospital. With the support of the group, he overcame communication problems, successfully passed a course of treatment in a psychiatric hospital and discovered a new activity for himself – a sand therapy. Andriy, 36 years old. He had difficulties in the family and at work. Through systematic meetings, he improved communication with his wife, solved the issues at work and took new projects. Andriy has a strong desire to be a co-trainer of the Peer Support Group. Each member of the group has its own story and is proud of it. We at Pobratymy and Dopomoha Ukraini are proud of our participants. 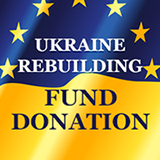 To continue the program in 2019, Canada Ukraine Foundation requests assistance to raise $26,000. Tax receipts available. beyond through the activities of the Ukrainian Language Education Centre (ULEC) at the Canadian Institute of Ukrainian Studies (CIUS), University of Alberta. 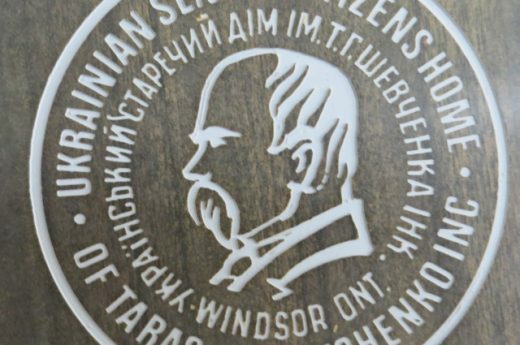 On behalf of the Board of Directors of the Canada-Ukraine Foundation, I would like to acknowledge and thank the Trustees and Members of the Ukrainian Senior Citizens Home of Taras H. Shevchenko (Windsor) Inc for their $ 500,000 gift to the CUF Endowment Fund (II). The whole country remembers her face: 21-year old Olesia Zhukovska was that young volunteer medic who received a gunshot wound on Maidan on February 20, 2014 – on the most tragic day of the standoff between activists and law enforcement. She has miraculously survived, unlike dozens of other activists who died of gunshot wounds that day. While inside the ambulance she posted a goodbye message on social media saying: “I am dying”. Luckily, the girl survived. UCMC spoke with Olesia four years after that tragic day asking her how she remembers February 20, 2014, as well as what her life turned to be like afterward, what her today’s dreams are and what she thinks about the changes in the country. Olesia Zhukovska was born in Krements, Ternopil region, in western Ukraine. Her father is an animal farm worker, her mother is a nurse. She graduated from a medical college in Kremenets and started working as a nurse. She first came to Maidan on December 4, 2013. She was staying in the tent city and in the buildings of the Trade Unions House and of the Kyiv City State Administration the protestors had seized. 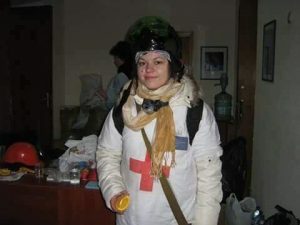 Olesia was a volunteer paramedic, on Maidan she was making medical shifts, bringing the medicine to those who needed it as well as consulting the patients at a medical point set up at the Kyiv city state administration. She turned 21 in January 2014. “Olesia, 21 years old, from Kremenets, Ternopil region. She came to Maidan on December 4. 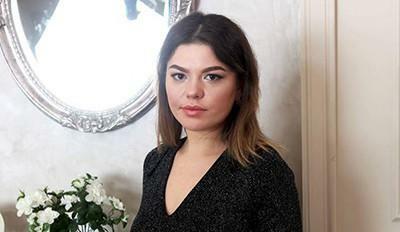 She was the only girl alongside 16 guys on the bus heading to Maidan. She knew no one. Last time before that she was in Kyiv when she was an eighth-grader. 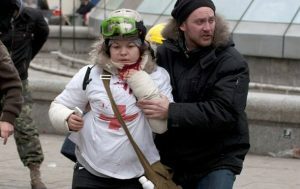 She was very much indignant at the beating of students by the Berkut riot police on November 30. The first time she came for five days and was just talking to people. Throughout all that time, Olesia was traveling back and forth to Kyiv from home more than ten times. She actually lost count. She volunteered in the kitchen, on December 31 she started being a volunteer medic. The girl has a college diploma of a medical assistant. On January 19 she worked at Hrushevsky street, exactly when the situation escalated. ‘At night, on January 20, a stun grenade fell beside me, it stunned me a bit. It was the first time I got really scared,’ she says.” Kristina Berdynskykh, journalist, author of #maidaners project on the Maidan activists. “For me, there were two Maidans: a kind, bright and peaceful one, and a bloody and dark one ..,” Olesia Zhukovska wrote on Facebook on November 17, 2014. On Maidan she made friends and found like-minded people, she was leaving it only at times when she had to go home, mostly to get treatment, as the nights spent on Maidan resulted in her getting a cold or tonsillitis. In February 2014, Olesia went to a hospital, she checked herself out of the hospital three days before February 20. “During her volunteering times, Olesia met many people. With a special warmth, she speaks about the ‘hell’s barrel’ near the column. It was a tent, a warm-up point. People from different regions came there – from Luhansk, Zaporizhia, Poltava, Ternopil. When the February 18 events commenced, the tent got burnt down. Olesia got ill several times, she had tonsillitis and a cough. She was going back home to get treatment, was getting better and went back on Maidan. On February 17 she checked out of the local hospital and the next day departed to Kyiv. On February 19, she was already on Maidan, she was on shift all day and all night long until 4am. ‘I just came and I wanted to do more,’ Olesia explains.” Kristina Berdynskykh, journalist, author of #maidaners project on the Maidan activists. “I got this photo sent to me today for the first time. February 19, 2014. This is the medical point on Prorizna Street. The photo was taken by Mykola Vlasenko – medic at the two Maidans and medic in the combat zone.” Olesia Zhukovska, Facebook post of February 20, 2018. On February 20, Olesia woke up in the morning and went to the Mykhailivsky [St. Michael’s Golden-Domed Monastery – UCMC] to pick the medicines – she wanted to take it to the medical point by the Christmas tree. On her way back from the Mykhailivsky she stopped by the Lyadski gates on Maidan as she met her friends from the “hell’s barrel”. She looked at her watch, it was 11.37. At 11.40 she got shot by a sniper. “We did not know exactly what was going on on Instytutska street. I was the first to get wounded in that location. I did not understand what was happening. The guy standing opposite from me told me: ‘Sweetie, you got wounded.’ Then I put my head down and realized that my coat got steeped in blood from the top to the bottom in a second,” Olesia told in a commentary to UCMC. After the injury Olesia was operated, she stayed at the Kyiv hospital no.17 for 11 days. Luckily, the bullet did not hit the carotid artery. On March 2 she ran away to Maidan again. “I am going to Maidan today, I can’t just be staying at hospital listening to the news, I will go to Maidan, at least for a little while! We have to fight! It’s our country!” she wrote on Facebook on March 2, 2014. Later, after she checked out from the hospital, she visited France as part of the mission headed by Petro Poroshenko on March 7-13. During the visit, she met the President of France François Hollande. “Right after the injury, I went abroad, to meet the President of France François Hollande. My mission was to testify what happened on Maidan,” Olesia told UCMC. 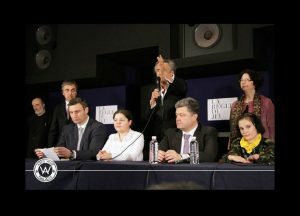 The investigation as to the killings on Maidan started straight away, however, it has provided no convincing results or, most importantly, sentences or actual imprisonments, even four years after those events. [Read also: “Four Years after the Maidan, How Is the Investigation Going?”] Olesia, same as other victims, was testifying. “There was an investigation. Six months after I was summoned by an investigator, then by another one. I was testifying, same as everyone else did, helped with investigative experiments. I was told that it was a Berkut policeman who had shot me and who then fled to Russia and that the weapons were destroyed. I did not even memorize his surname,” the girl said. It does not look like Olesia is into taking revenge on her abuser. She is just on to another day. After the Maidan, she decided to seriously dedicate herself to medicine. Before the Maidan events, a graduate of a medical college, she used to work as a medical assistant in the village, but actually wanted more. In summer 2014, she entered the Bohomolets National Medical University in Kyiv and has been living in a student’s dormitory since then. Despite the widespread information on the corrupt nature of medicine in the country and the medical education, in particular, Olesia entered the university without any problems, to study free of charge. She was accepted straight to the second year of study, as she was already in possession of a basic medical degree. It may well be that having become recognizable in the country after her injury on Maidan, it played to her credit in course of the selection, but Olesia is not aware of it. She says she has not been facing corruption in the university. “My classmates are all contract-based students [who officially pay for their studies – UCMC], the marks they get are the result of how they study,” she says. Olesia finds studying exciting, but it is quite demanding. She is in her fifth year now, there’s one more year to go, and the compulsory internship afterward. She has little free time left, but in four years she took part in many volunteer projects. “Whenever I have spare time, I go to animal shelters, to the military hospital. With a friend of mine we also went to help weave the masking camouflage nets for the military,” she says. Neurology and gastroenterology are the medical branches that she is most attracted to. “My dream is to become a gastroenterologist, a nutritionist,” Olesia says. “I love myself and I want to be a better version of myself,” she explains. Olesia is 25 now. Every year, on February 20, journalists write her and recall the events of this day four years ago. Olesia says she is flattered that they remember her, but does not really like to give interviews. She does not comment on the Ukrainian reforms and preferred not to say whom she plans to vote for in the upcoming elections. “Of course, there is disenchantment and sadness, but I think, everything must not happen at once. We did our internal revolution, while the aggressor state attacked us. Who could have foreseen that?” she says. The girl considers the date of February 20 to be her second birthday, and has no regrets about anything. “I have no regrets, I regret neither coming to Maidan, nor my injury. It is an important lesson to me. When I took to Maidan, I wanted the changes in the country and in my life. It is exactly what happened. Copyright © 2018 Ukraine Crisis Media Center, All rights reserved. It is hard to believe that it has been 4 years since the Revolution of Dignity started in Kyiv. From the outset, Canada-Ukraine Foundation (CUF), through the generous donations of the Ukrainian Canadian Community, started to assist the injured from the Maidan with medical supplies and pharmaceuticals. Later, in the fall of 2014, we started restorative surgeries on the victims of the Russian aggression through our Medical Missions. Our fifth Mission was completed in March 2017 – a total of 300 surgical operations have been done on 178 patients. 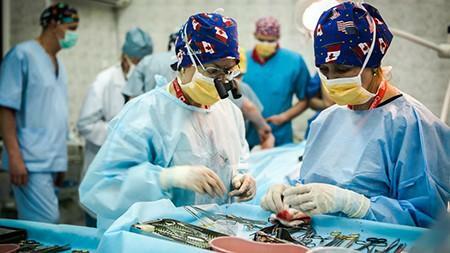 97 hand therapy procedures were done as well for those who did not require an operating room. CUF had been concentrating its efforts on wounded adults and not on another vulnerable segment of society – the children in orphanages. During the fifth Mission, I was introduced to Stepan Terletsky who is an orphan advocate in Ukraine. Stepan is the director of Mercy Trucks Ukraine who have been working for the past 7 years on dental issues of children at orphanages using a dental mobile clinic and a team of volunteer dentists and hygienists. Why worry about dental issues? What’s the connection between oral health and overall health? Studies also suggest that oral bacteria and the inflammation associated with periodontitis — a severe form of gum disease — might play a role in some diseases. In addition, certain diseases, such as diabetes, can lower the body’s resistance to infection, making oral health problems more severe. No defect and teeth abnormalities identification. Children are not provided with preventive examinations, the problem solved by removing the teeth instead of treatment! When we look at the budget for orphanages it becomes very clear. There are 751 orphanages in Ukraine. $ 240 million US was spent by the government on the orphanages in 2016. This is $2,264.15/year per child or $6.20/day per child. However, 85% of this amount is spent on staffing and building maintenance, the orphans must get by on $ 1/day. From this $1.00, only $0.01 is allocated for all health treatments. $0.87 goes for food. In 2016, there was $10,000,000 US of charitable assistance donated for orphanages in addition to the Government support. Only 7% are true orphans, the rest are economic orphans – their families cannot afford to keep them at home. So how could CUF not respond to this appeal? We signed on for a pilot program of four sites in Odessa Oblast for 2017. 568 dental fillings; 56 teeth extractions; 54 dental cleaning and 33 canal treatments. Expenses were for: dental medical suppliers and materials; gasoline for mobile dental clinic; transportation for doctors and assistants; food for doctors and volunteers, etc. General budget for 4 missions: $ 8,000 CDN. That works out to $21.50 CDN per child! It is now clear to us that further work is required, and the costs are extremely reasonable. CUF has started discussions about a 10-site program for 2018 if volunteers are available. This will only mean a cost of $ 20,000 CDN. In addition, because the truck is now 10 years old, we will be preparing a replacement budget item for this as well. The impact on these children is without measure. Psalm 10: 17-18 …. Lord, you know the hopes of the helpless. Surely you will listen to their cries and comfort them. You will bring justice to the orphans and the oppressed, so people can no longer terrify them. Victor Hetmanczuk for NP-UN, Toronto.